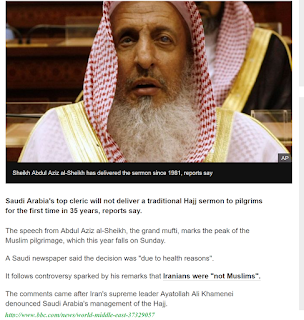 Proving the point raised by critics of Saudi religious figures who often use religion to silence dissenters, the Grand Mufti of the kingdom took a page from ISIL's book and issued a fatwa declaring all Iranians kuffar (non-Muslim) after the leader of that country accused the rulers of the kingdom of negligence when managing Hajj. More than 450 Iranian pilgrims died last year-2015, among thousands more mostly from Africa and Asian countries, and no credible investigation was conducted to reassure pilgrims and punish those found guilty of negligence. The Kingdom established a committee headed by the crown prince, who is also the interior minister, the institution that is overseeing Hajj. In a sense, the rulers established an investigative committee headed by the same person accused of incompetence. Even so, the committee, still, has not published its findings. Instead of addressing the issue, the Mufti, Abdul Aziz Al Sheikh, used religion and issued the exclusion decree, takfir, labeling Iranians "non-Muslim, majus, who worship fire." Perhaps realizing the gravity of this practice, the kingdom announced that the Mufti will not be giving the sermon in the pilgrimage this year, a first in more than 30 years.